The Kiwi 2 Berth camper is a top of the range Kea-built 2006/07 VW T5 1.9L Turbo Diesel that has all the accessories of home and drives like a car. It is a spacious, comfortable, economical drive. You can travel in style, sleep in a huge double bed, and cook in new facilities. This camper is ideal for a couple or friends. The camper has a kitchen, foldaway table, extra large bed, gas stove, microwave and fridge, also a Thetford Portaloo. The minimum hire period is 18 days, except for one way hires which is 21 days. Pacific Horizon Eclipse 2+1 (big bed) is an attractive, well-equipped, competitively priced motorhome, ideal for a couple or a couple and an older child (child up to approx 8 years). Baby/Booster seat fitting with one tether point. Diesel engine with economical running costs even on long trips, 5-stage tiptronic automatic Certified self contained and permitted at all freedom camping spots in New Zealand. Model age is 2011. Add NZ$35 per day extra to request an Elite model guaranteed under 2 years of age (subject to vehicle availability). 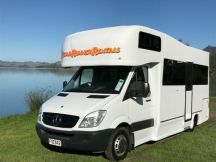 Auckland to Christchurch OR Christchurch to Auckland - this is a great vehicle for long hires of 25+ days and NO one way fee! Please not one way fee will be waived on booking. These vehicles have been very popular. Being 11 - 13 years of age they are well used with high km vehicles. A good choice for a budget minded traveller who doesn't mind a vehicle that has been around the globe a couple of times. Features internal access from Campervan to driving cab and dining area that converts to a large double bed or two single beds. Interior has been updated. 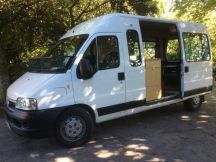 This vehicle has solar power which makes it ideal for a couple on an extended holiday wanting to freedom camp for long periods. Spoil yourself with the spacious interior of the Mercedes Benz 6 Berth Super Cruiser Motorhome with 7 seatbelts. Featuring large panoramic seating this motorhome is a very popular choice. You are viewing page 1 of 19.